Chanukah partying is not just for the young. We adults deserve something to help us celebrate the holiday with spirit, or maybe spirits. Accordingly, here are a few cocktails to toast the season. The Chocolate Gelt features chocolate-flavored vodka, a clear spirit, and cinnamon-flavored Goldschläger with its tiny flecks of real gold. 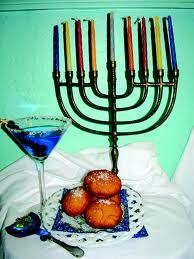 The Sufganiyot (Jelly Doughnut) depends on an unusual ingredient — Manischewitz sweetened blackberry wine. When I was developing the cocktail, I tasted all kinds of berry-flavored liqueurs and couldn’t find one that I liked for the drink. In the back of my liquor cabinet was the Manischewitz, a dusty leftover from seders past. One sip, and I knew I had found the “jelly filling” for my Sufganiyot. It adds a soft berry note to the citrus and vanilla vodkas. The Chocolate Egg Cream Shot differs from the traditional New York beverage in several ways. It is small (just a few ounces), alcoholic and actually uses cream. Instead of Fox’s U-Bet chocolate syrup, it uses chocolate liqueur (such as Godiva) or flavored chocolate liqueur (such as Sabra). The sweeter dark crème de cacao also will work.